“I started for all the wrong reasons,” Kenney Polson said. Polson is a member of the MHCC District board of directors, elected in 2015 to a four-year term. 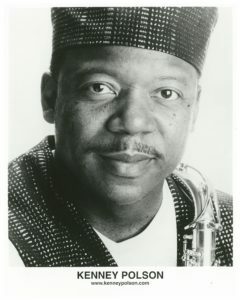 He is also a world-traveling, accomplished saxophonist/composer. This summer he plans to be touring with a well-known group, the Stone City Band, playing the saxophone. Polson said he started playing saxophone mostly by chance. He retold the story of how he met a “lady” in seventh grade. “She was going into the band room,” he said. Following the girl into the band room, he decided he needed to play drums “because that’s where the girl was,” he laughed. Polson and the band teacher fought over which instrument he would play and in the end, the 13-year-old Polson picked up the saxophone. Since then, the board member has been avidly playing saxophone along with a number of other instruments. “Which ones don’t I play,” Polson responded, before ticking off “alto sax, clarinet, flute, oboe, drums, keyboards, and a little bit of French horn,” not fully completing his list. Before coming to MHCC, the musician worked as a band instructor at Portland’s Cleveland High School and Hosford Middle School. He has an associate of arts degree from Fresno City College, a master’s degree in jazz composition from Howard University, and an education specialist degree from Lewis & Clark College. Polson has traveled the world teaching and performing his art. “I’ve been to 50 countries and I’ve performed in all but two,” said Polson. He also has made teaching stops at Marylhurst University, Merced College, the International School of Beijing, Howard University, and the American School of Rio de Janeiro. The board member recalled going to the Louvre Museum in Paris and being enthralled in the art. “I love the visual arts,” he commented, adding that he has gone to many famous artist museums while abroad. Currently, Polson serves on the MHCC board and is a member of a four-person band, The Kenney Polson Project. The musician’s goal is to “not only educate but to serve the community” on the college board, he said. Polson has formed his own local band that consists of him on the sax, a piano-keyboard player, a bass player, and a drummer. A guitarist is his next planned addition, he said. He would love a set-up where he could go and record music every day. Meanwhile, the Stone City Band was made famous by its famous frontman, Rick James, performing funk, rock, and soul music. The lyrics “She’s a super freak, super freak, she’s super-freaky, yow” from the song “Super Freak” run through the mind when thinking of James.